The Forest of Compiègne (French: Forêt de Compiègne) is a large forest in the region of Picardy, France, near the city of Compiègne and approximately 60 kilometres (37 mi) north of Paris. The forest is notable as the site of the Armistice between the Allies and Germany which ended World War I on 11 November 1918, as well as the Armistice of 22 June 1940 after the Battle of France in World War II. On its northwest, the forest hugs its small namesake city, and to its north and northeast, beyond the Aisne, lies the large national forest of Laigue (Forêt Domaniale de Laigue). Around its remaining perimeter, it contains or is adjacent to numerous communes including Vieux-Moulin, Lacroix-Saint-Ouen, Saint-Sauveur, Béthisy-Saint-Pierre, Saint-Jean-aux-Bois, and Pierrefonds. On its south it borders the Forest of Halatte. The most prominent tree species are oak (Quercus robur), beech (Fagus sylvatica) and hornbeam (Carpinus betulus). :776 Much of the oak was heavily harvested over the centuries but was replanted aggressively in the nineteenth century when fears of deforestation began to be addressed. Since the late twentieth century, the North American black cherry tree (Prunus serotina) has spread vigorously throughout the forest, eliciting mixed reactions from local arborists. Numerous flowering plants thrive in the woods,:749 notably large numbers of Lily of the Valley (Convallaria majalis). :92 Small lakes, ponds, brooks and springs abound throughout the forest,:749 including the Spring of Saint-Sauveur,:131 which is actually a pair of therapeutic mineral water springs running both hot and cold. The forest sustains a great number of game animals including deer, rabbit and wild boar, and the varied terrain – plateaus cut by valleys and gorges, hills, streams and ponds – makes for challenging hunting. For centuries the Compiègne forest has been a prized hunting ground for virtually all the kings of France. :101 Some 350 roads and pathways cross it adding up to over six hundred miles of trail with stately vintage signposts marking most of the intersections. The oldest ones include a small red mark which shows the direction to the château, relics of an imperial order given during the Second French Empire after the Empress Eugénie found herself lost in the thick woods. The forest of Compiègne is a popular destination for all types of tourists. Horse-riders and bicyclists particularly enjoy the forest; a long-running bicycle event, the Paris-Roubaix race, has an established path through the forest. The forest of Compiègne area shows evidence of prehistoric habitation, and continuous forest cover has been definitively proven since at least the end of the Roman Empire. Gallic-Roman edifices have been discovered there, and it is traversed on its south and east sides by an ancient Roman road now called by the French the Chaussée Brunehaut. During the Gallic Wars, Julius Caesar won a decisive victory in the forest, defeating one of the larger tribes of north-eastern Gaul, the Bellovaci. A multitude of the forest's classical-era artifacts are on display at the Château's museum. Most French monarchs enjoyed extravagant hunts at Compiègne. This 1811 oil painting by Carle Vernet depicts the Emperor Napoleon I at his sport. Further avenues connected by an octagonal ring were opened through the woods for the formal hunting parties of Louis XIV, and under the Ancien Régime the number of rides was increased to 200. Napoleon opened the avenue of Beaux-Monts (illustration). Prior to the Industrial Revolution, the lush woodlands provided lumber for a thriving woodworking community around Compiègne. One of the most popular products supplied by the forest was beech oil, used for cooking and folk medicines: it was bottled in prodigious quantities and sold worldwide from Compiègne through the 19th century, until its marketshare was supplanted by newer, more refined oils. The forest of Compiègne witnessed much activity during the reign of the Emperor Napoleon III, for whom the abundant forest was a personal favorite retreat. The Emperor was an avid huntsman, and he reconstituted the forest as grand hunting grounds, even going so far as to revive the age-old office of Grand Veneur to oversee it. The Emperor had a deep affection for the forest and frequently organized his hunting parties at the King's Well. :321 In addition to hunting parties and competitions, the forest of Compiègne was the scene of extravagant receptions, parties and even theatrical performances. The forest of Compiègne was the site of the Armistice between the Allies and Germany which ended World War I on 11 November 1918. The French commander-in-chief Marshal Foch convened the armistice talks deep in the forest beside the tiny village of Rethondes,:261 with an eye towards secrecy because he wanted to shield the meeting from intrusive journalists, as well as spare the German delegation any hostile demonstrations by French locals. During World War II, a second treaty was signed in the forest, this time arranging an armistice between France and Nazi Germany (22 June 1940). 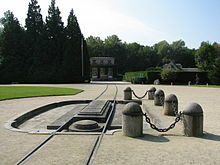 With an unmistakable desire to humiliate his defeated enemy, German dictator Adolf Hitler gave orders that the surrender should be received in exactly the same spot, even the same railway car, where the Germans had surrendered in 1918. Ferdinand Foch outside the armistice train. The Great War concludes, 11 November 1918. Hitler observing the statue of Marshal Foch, before launching the negotiations, 21 June 1940. The second Treaty of Compiègne, 22 June 1940. A memorial slab marks the location of the original railcar at Armistice Clearing. A memorial site called Clairière de l'Armistice ("Glade of the Armistice", or "Armistice Clearing") covers the historic treaty area. Additions include a statue of Marshal Foch and the large Alsace-Lorraine Memorial, which depicts an Allied sword pinning down an Imperial German eagle. A famous memorial tablet placed at the precise location of the cease-fire signing reads (in French), Here on the eleventh of November 1918 succumbed the criminal pride of the German Reich... vanquished by the free peoples which it tried to enslave. :50 The original tablet was destroyed by the Nazis, but a new one was emplaced after the war. For bringing the German delegation to the 1918 meeting, the French had assembled the train with a special saloon car which had once belonged to Napoleon III. The car was decorated with old Imperial emblems, redolent of past glories and mutely confirming the resurgence of French power after its defeat in the Franco-Prussian War in 1870. The two sides then met in a newer railcar, supplied by Compagnie Internationale des Wagons-Lits, to sign the armistice. After the fall of France in World War Two, this same railway carriage was specifically used by the Germans for the armistice of 1940; it was remanded to Germany where it was eventually destroyed by SS troops in Crawinkel, Thuringia, in 1945, and the remains were buried. In 1950, a faithful replica of this original railcar was installed at the site. Decades later, some vestiges of the original car were discovered in Germany and returned to France: the pieces were added to the memorial display in 1995. The Armistice Clearing remains open to the public six days a week. Visitors routinely leave photographs and other mementos to be displayed or stored in the museum, making it "an ever-changing place of pilgrimage". ^ a b "The city and forest of Compiegne near Paris". Paris Digest. 2018. Retrieved 2018-08-05. ^ a b c "Compiègne Forest". Office de Tourisme de Pierrefonds. 2010. Archived from the original on 24 July 2011. Retrieved 2010-12-29. ^ a b Laughlin, Clara E. (1919). 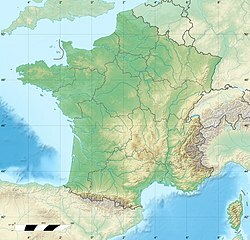 The Martyred Towns of France. New York: G.P. Putnam's sons. ISBN 978-0-548-07018-5. Retrieved 2010-12-30. ^ Woolsey, Theodore Salisbury, Jr.; Greeley, William Buckhout (1920). Studies in French Forestry. New York: John Wiley & Sons. pp. xxi. OCLC 3794852. Retrieved 2011-01-04. ^ a b c d Littell, Eliakim; Littell, Robert S. (1893). The Living Age, Volume 198. Boston: The Living Age Co. Inc. OCLC 447927755. Retrieved 2011-01-03. ^ "Compiègne Forest". Google Maps. 2011. Retrieved 2011-01-07. ^ a b c Hare, Augustus John Cuthbert (1890). North-eastern France. London: G. Allen. OCLC 1737047. Retrieved 2011-01-04. ^ New York Times Co. (1918). New York Times current history: the European war, Volume 16. New York: New York Times Co. p. 6. Retrieved 2010-12-30. ^ Dana, Samuel T. (November 1914). "French Forests in the War Zone". American Forestry. American Forestry Association. 20 (11). Retrieved 2010-12-30. ^ Evans, Julian (2009). Planted Forests: uses, impacts, and sustainability. Oxfordshire: CABI. p. 7. ISBN 1-84593-564-0. Retrieved 2010-12-30. ^ McNeely, Jeffrey A. (2001). The Great Reshuffling: human dimensions of invasive alien species. Cambridge: IUCN. p. 155. ISBN 2-8317-0602-5. Retrieved 2010-12-30. ^ Robinson, William (1903). The Wild Garden. London: J. Murray. OCLC 476229043. Retrieved 2010-12-30. ^ Stevens, Anthony (2001). Ariadne's Clue: A Guide to the Symbols of Humankind. Princeton, NJ: Princeton University Press. ISBN 0-691-08661-3. Retrieved 2011-01-03. ^ Stedman, Thomas Lathrop (1918). A Practical Medical Dictionary (Fifth Ed.). New York: William Wood and Co. p. 869. OCLC 68605315. Retrieved 2011-01-03. ^ a b c d Sciolino, Elaine (2 November 2008). "North of Paris, a Forest of History and Fantasy". New York Times. Retrieved 2011-01-04. ^ Armijo, Vic (1999). "Chapter 3: Legendary Racers and Races". The Complete Idiot's Guide to Cycling. USA: Penguin. ISBN 0-02-862929-9. Retrieved 2011-01-03. ^ "Foret de Compiegne and Foret de Laigue". Sheldrake Press. Retrieved 2011-01-03. ^ a b c Sax, Charles; Géralde (1916). The English Tourist in France. Paris: Delagrave. p. 211. OCLC 29085264. Retrieved 2010-12-30. ^ Plue, Jan; Hermy, Martin (1987). "Persistent changes in forest vegetation and seed bank 1,600 years after human occupation". Landscape Ecology. 23 (6): 1. doi:10.1007/s10980-008-9229-4. Retrieved 2010-12-30. ^ a b c d e f Miltoun, Francis (1910). Royal Palaces and Parks of France. Boston: L. C. Page & company. OCLC 558333. Retrieved 2010-12-30. ^ Forbes, Henry O. (March 1922). "The Topography of Caesar's Last Campaign against the Bellovaci". The Geographical Journal. The Geographical Journal, Vol. 59, No. 3. 59, 3 (3): 195–206. doi:10.2307/1781759. JSTOR 1781759. ^ Baedeker, Karl (1878). Paris and its environs. Leipzig: K. Baedeker. p. 324. OCLC 220274784. Retrieved 2010-12-30. ^ Gregory of Tours, Historia Francorum i, book IV. ^ René Gast, La Picardie (Itinéraires de découvertes, éditions Ouest-France), 2003:111. ^ Society for the Diffusion of Useful Knowledge (1837). The Penny Cyclopædia of the Society for the Diffusion of Useful Knowledge. VII: Charleston - Copyhold. London: Charles Knight. p. 421. OCLC 220404996. Retrieved 2010-12-30. ^ ' "Beech and Linden Oils". Chemist and Druggist. London. 45: 145. July–December 1894. Retrieved 2010-12-30. ^ Beach, Frederick Converse (1903). "Compiègne". The Encyclopedia Americana, Volume 5. New York: The Americana company. OCLC 46309553. Retrieved 2010-12-30. ^ "Compiègne Forest". Fondation Napoléon. 2008. Retrieved 2010-12-27. ^ Fleury, Comte Maurice (1920). Memoirs of the Empress Eugenie. New York: D. Appleton & Co. OCLC 912797. Retrieved 2011-01-05. ^ Griffiths, William R.; Griess, Thomas E. (2003). The Great War. Garden City Park, NY: Square One Publ. p. 163. ISBN 0-7570-0158-0. Retrieved 2010-12-30. ^ Chickering, Roger; Förster, Stig (2000). Great War, Total War: combat and mobilization on the Western Front, 1914-1918. Cambridge, UK: Cambridge University Press. ISBN 0-521-77352-0. Retrieved 2011-01-03. ^ a b Best, Nicholas (2009). "Chapter 5: Friday, 8 November 1918". The Greatest Day in History. New York: Public Affairs. ISBN 1-58648-772-8. Retrieved 2010-12-30. ^ a b c Stein, Marcel (2007). Field Marshal Von Manstein, a portrait: The Janus Head. UK: Helion & Company Ltd. p. 116. ISBN 1-906033-02-1. Retrieved 2010-12-30. ^ Sulzberger, Cyrus Leo (1985). World War II. New York: Houghton Mifflin Harcourt. p. 163. ISBN 0-8281-0331-3. Retrieved 2010-12-30. ^ Commager, Henry Steele (1945). The Story of the Second World War. Boston: Little, Brown. ISBN 1-57488-741-6. Retrieved 2011-01-04. ^ Friedrich, Otto (4 September 1989). "Desperate Years". Time. Retrieved 2011-01-07. ^ a b c Futé, Petit. Best of France 2011. Petit Futé. p. 553. ISBN 2-7469-2967-8. Retrieved 2010-12-30. This page was last edited on 2 January 2019, at 01:14 (UTC).